I was playing Tomb Raider at the moment that I wrote this blog. I then deleted most of it accidently because I had to many windows open and I over wrote it with an earlier version after I had completed it. But at the time, on my other monitor I was staring at wolf footprints so large that they had to be from some extinct species of direwolf. Also, I was playing Eve. When I'm am doing low maintenance moving I occupy myself with other games at the same time. It is similar to reading books. I am normally reading two. While running around in Tomb Raider (this is the reboot) I learned that I can Master skills by sitting at my camp and using the experience points I didn't realize that I am getting. I do things like learn how to use a pouch to carry more arrows or burn meat over a fire. Very useful things that poor Laura was too stupid to figure out before she sat down at the campfire. Eve does not have the gain experience thing but it does have skills that let us do simple things more better. My level 4 alt is about to make her debut. For something so simple I have turned it into a stress filled overly complex situation where I can't make things fit as I'm supposed to. Buying skillbooks and rounding out what to me is the proper basic abilities of the account reminded me of how easy it is to miss some of the support and secondary skills. Most games will give you a skill set or a skill path. You learn fire. Then you learn bigger fire. Then you learn multiple fire. Some games are more complex and you can decide to learn how to make your fire burn hotter. Eve lets you play, learn to do things, and fly spaceships. It then has an entire layer of skills sitting out there that you find when you trip across them on the market because they are not prerequisite to fly, fit, or use things. I call them secondary skills. I may be incorrect in their usage. They are very, very useful and also very subtle. They are the non-flashy skills that give people that bit of umph. It is when you have five structure points left and know that is only because you topped out everything. Part of my early training was the skill training program Diz made up for me. I am shameless and just go running to him going, "Dizzzzzzzz! Halp!" I can make my own skill training programs and have. I just run them through him first because it is that easy to miss the support skills. 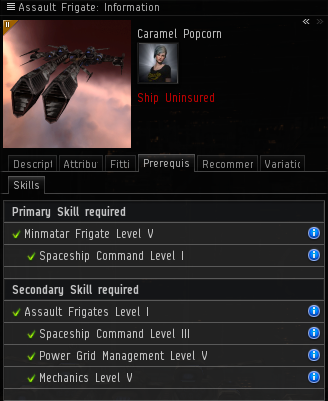 When you click on items in Eve many have a prerequisite tab. The prerequisite tab is fantastic. Most of us know about it. It also has one flaw. It is not a flaw that needs to be fixed.It is just a flaw for a player using the prerequsites to enter into a ship or module. The flaw is that it does not include the support skills. These are skills like EM/Thermal/Kinetic/Explosive Armor Compensation and Shield Compensation skills. Or Multitasking which is now Advanced Target Management. They are nestled in the skill lists on the market. They give things like 5% resistance per level. It is easy enough to skip when new but at some point the reigns have to be pulled and the training slowed down. New guns are cool. New ships are cool. T2 modules are cool. T3 ships are amazing. But skill training isn't just about getting the shiny things we lust for from the first few days. It is about crafting your account into what you want it to be. The other really neglected skill tree is rigs. Rigs are interesting. I remember Ender sitting me down and telling me I had to rig my ships. Big tears poured down my cheeks. "Rigs are expensive and I don't get them back!" I got over it (eventually, took a bit) and rigs are part of life. The interesting thing about rigs is that you can use them even if you do not have the skills trained. While it is a wonderful thing and allows for one to fit above ones skills it also allows for laziness in skill training. It is so easy to just put that rigging skill aside for all of the other things... and then it never gets learned. I've been faced with that with my little mission alt. She has random holes all over her skill plan because she has not been used for actual combat. One tends to find those skill holes a bit faster. It made me look over Sugar's plan and start intermixing those skills in to top them off. Rig skills are also high on my list. 10% decrease per level to the rig penalties per level is significant. I have seen someone correctly guess someone's armor rig level due to his ship speed (amazing ability that and I knew both parties to verify the information). I also realized that I had not clearly taken into account that there are people out there who do possess the ability to equally armor and shield tank. For PvE I can understand (I think) but for PvP it seems to be a critical skill. Yet, I also have to remember that different groups fight in different styles. I can name off at least one group that I have never seen in anything but armor. My first reaction is, "why" but then not everyone flies like I do or thinks Jaguars are amazing. Skills have been on My mind a lot. Chella has chewed through Van's Guardian requirements. Sugar is turning into a solid little PvP character. I've felt more "I can fly that" these days. It is a lovely sense of accomplishment. 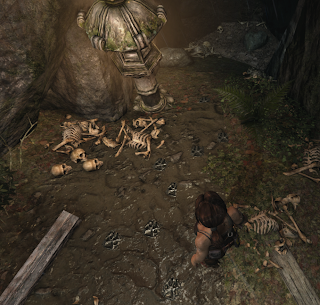 As for Tomb Raider, I like it but I'm rolling my eyes as well. When someone drags me into a story for me to experience, them making me experience situations in ways I would not react to in person makes the entire event a bit silly and I wind up wanting to slap the character instead of bonding with them. After dying to a wolf a dozen times when I was originally writing this post I decided, as I crawled out from under its carcass, that they are direwolves. New players really should get EVEMon and use it to discover skills they don't know about. I wrote about that here. New players will be helped by the certificate system after it's new version is released with Rubicon in November, it is setup to show support skills and ship mastery levels.